This description, and the many, many others that like to describe Abgobloshie as “vast“, is false (I’ve reached out to Schiller for his source – did he visit? – but he hasn’t responded). Agbogbloshie is, in fact, small. Its street frontage is roughly 200 meters, and it extends back roughly 450 meters. But I’d estimate that only about half of it is actually utilized; overall land use is extremely inefficient, especially for a scrap zone home to perhaps 200 small businesses. Below, I’ve pasted a Google map showing the outlines (click to enlarge). If you want to know more about what’s actually going on in there, here’s a geo-tagged map showing various activities by the fantastic folks at the Agbogbloshie Makerspace Project. Note that the geo-tagged map shows activity to the left of what I show below – that’s because the geo-tagged version hasn’t been updated since the local government shut down those businesses in late March (mostly plastic recyclers). That’s right, Agbogbloshie is shrinking. In human terms, that means you can walk from one end of Agbogbloshie to the other end in a couple of minutes (which I did, several times). If, like me, you spend time in the world of globalized recycling, that’s nothing special size-wise, equivalent to a large – but not unusually so – scrap yard in the U.S. or EU, and much smaller than most landfills. 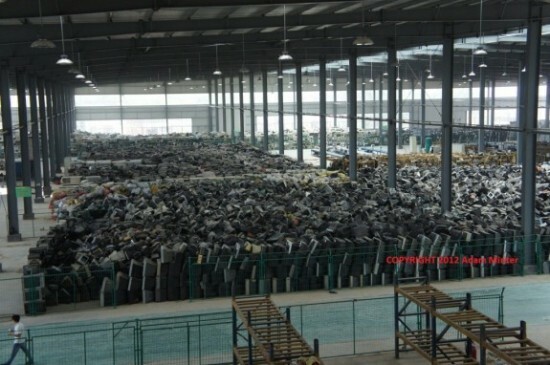 Elsewhere in Africa, there are far larger recycling and dump sites (Dandora outside of Nairobi comes to mind), and in Asia they’re even bigger (Guiyu is an actual town). That’s why, five minutes after taking my first step in Agbogbloshie, I found myself utterly bewildered, and turning to my companion and guide to ask: “This is IT?” It was. So what, then, are we to make of images, such as the one below (taken by me), that seem to suggest a much bigger space, extending out into the horizon? If you look at the above satellite view of Agbogbloshie, you’ll note quite a bit of empty space abutting the site – much of that is open fields and a city dump. It is not, however, related to the recycling of electronics. For a photographer, though, it’s a great backdrop (I’ll get to the question of what’s being burnt, shortly). Since we’re on scale, I’d like to touch on a related point. 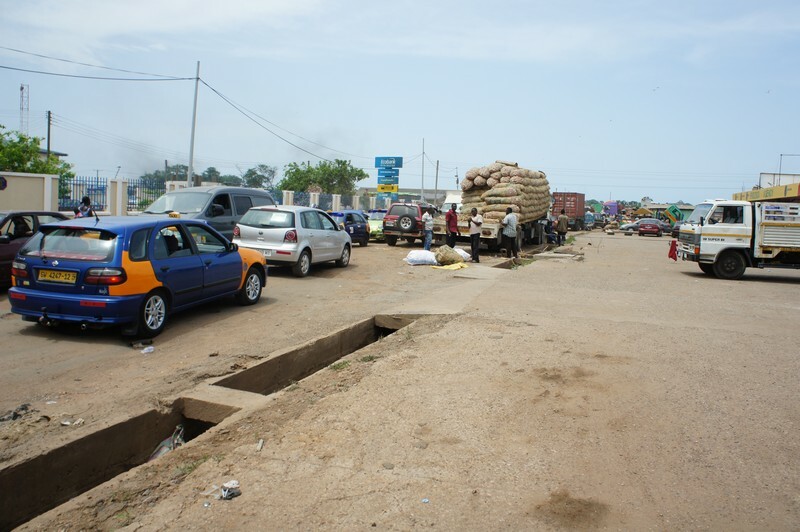 Is Agbogbloshie a slum? Yes and no. Yes, in that the tens of thousands of people who live in the area do not live well. No, in the sense that it’s primarily a traffic-choked industrial zone home to – among other businesses) a Pepsi bottling plant directly across the street from the scrap zone (the Pepsi plant’s manager, according to this source, doesn’t appear to want anything to do with its recycling neighbors), car dealerships, a brewery, a vegetable market (specializing in yams and onions) and hundreds if not thousands of small workshops devoted to making everything from cooking pots to electrical transformers. Here, for example, is the traffic heading into Agbobloshie. Note the load of yams definitely not bound for the recycling zone. And here’s what the actual frontage directly outside of the scrapping zone looks like. 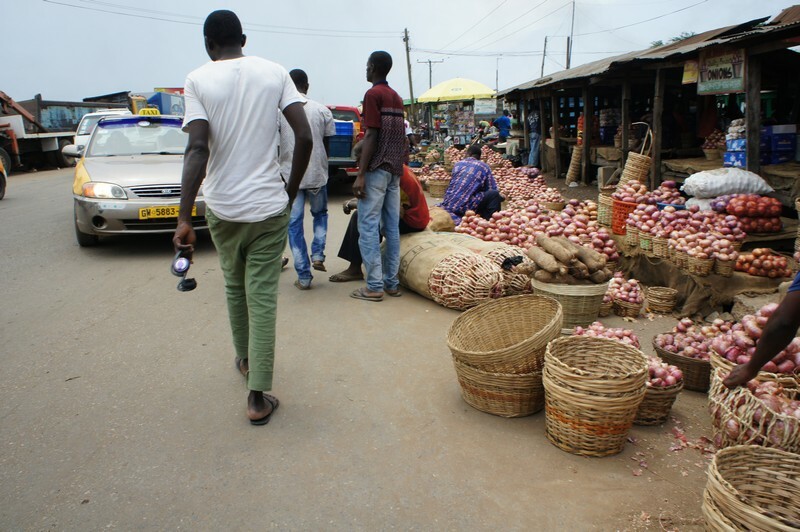 “Agbogbloshie,” the scrap zone, is entered via one of two entrances abutted by the onions. Here’s one of them. This image brings me to the question of volume. Specifically, how much e-waste can be jammed into a 200 x 450 meter space in the middle of one of Africa’s busiest, most traffic-choked cities? At any given time, there are perhaps 10 to 20 men (always men) pulling these four wheelers. 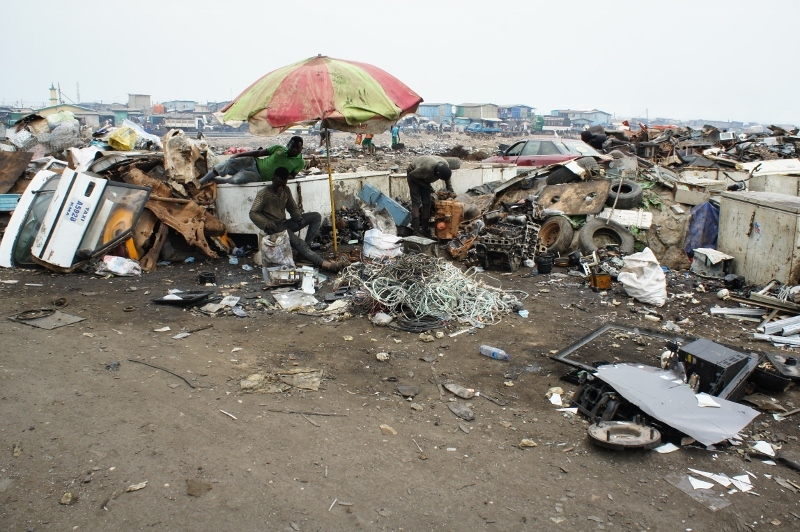 The scrap they carry mostly comes from within Accra itself, sold or given to them because the devices no longer function. The closest port – Tema – is roughly 21 miles away, and though these men are incredibly fit, it’s unlikely that they’d find it worthwhile to traipse a near Marathon distance for the meager profits from three microwaves, four televisions, and a transmission case. To be fair, I also saw scrap delivered in taxis, and pickup trucks, and one rickety flatbed. But shipping containers? Never. 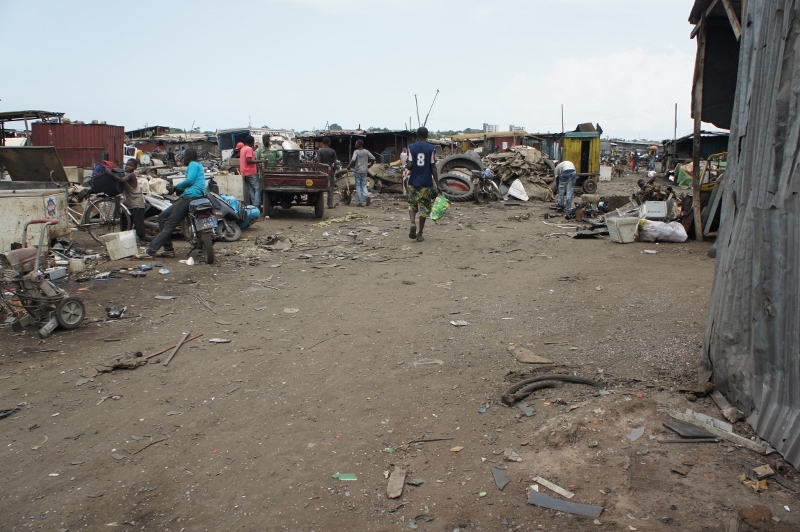 So how much scrap ends up in Agbogbloshie every day? The only study that’s ever tackled the question systematically was published in 2011 (funded by the European Commission, Norway, the United Kingdom, and the Dutch Recyclers Association, and coordinated by the Secretariat of the Basel Convention), and it found that – in 2009 – Ghana (not just Accra) imported 215,000 tons of used electronics. That sounds bad until you read the kicker: of that imported electronics, 70% was still functioning and usable, and the other 20% could be repaired. So let’s do some math. The UN’s Solving the E-Waste Problem [StEP] initiative estimates that global e-waste generation in 2014 was 46.8 million short tons [41.8 million metric tons]. Let’s assume, for the sake of argument, that the amount of e-waste imported into Ghana tripled since 2009 (probably not, but I can feel the gaze of my critics), to 645,000 tons. If 90% of that is re-usable and/or repairable, that means 64,500 metric tons – or 72240 short tons – is not usable a.k.a. it’s e-waste needing to be recycled. And that figure is undoubtedly too high. How much too high? And what do the scrappers say? 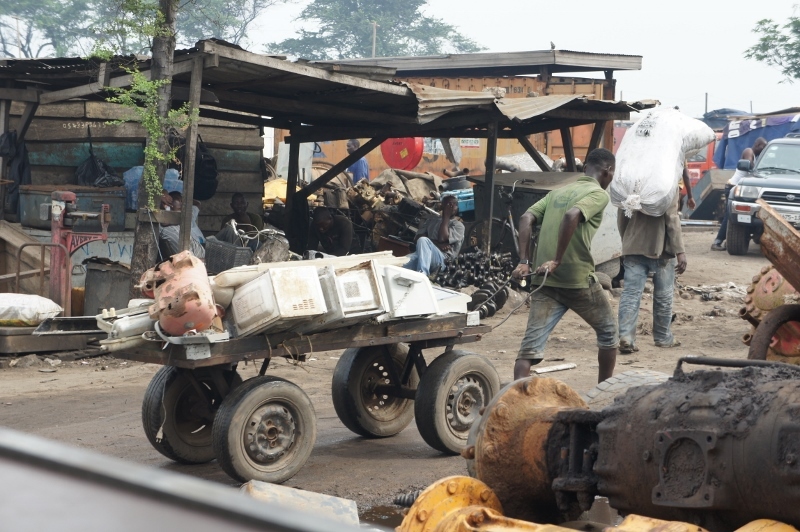 Around Agbogbloshie, I was told that the scrappers recycled between 30 and 50 televisions and computer monitors per day (monitors are the heaviest component of the e-waste stream). I checked with some folks I know in the monitor recycling business, and they told me that 50 lbs per monitor is a good average. So, as a safe conservative estimate, let’s say that Agbogbloshie recycles one short ton of monitors per day, and 365 tons per year. Now, it’s not hard to do this calculation (thanks to Robin Ingenthron at the Good Point Recycling blog for doing a version of it first). But, for some reason, the media organizations that insist on sending photographers to document Agbogbloshie never bother to look up the 2011 study, or do the calculation. Rather, they just say whatever sounds most shocking. 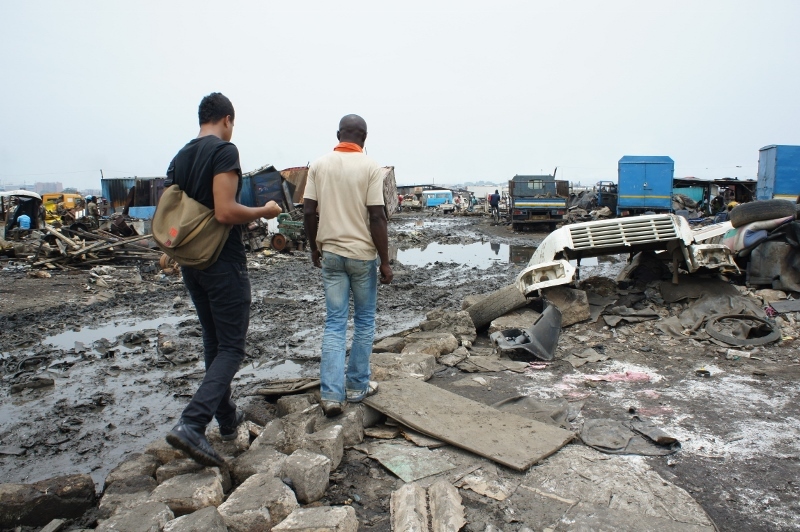 For example, as far back as 2008 (to be fair, pre-study), PBS Frontline claimed that “hundreds of million of tons” of e-waste arrive at Agbogbloshie annually (which would make e-waste one of the world’s most shipped manufactured goods)! Most news organizations, however, are a bit more responsible, and either hedge their bets by sticking to “biggest” and “largest” or – as in the case of Gizmodo – show a bit more courage (though not more sourcing) and say “millions of tons.” None of this is even remotely true. So let’s go back to the beginning of this post. Here’s what roughly 5000 monitors look like (there’s more both to the right and left that didn’t fit my frame). 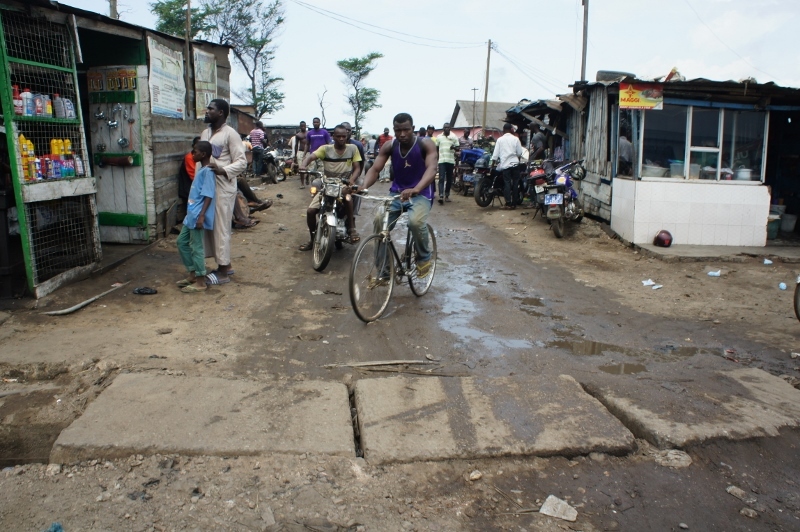 And here are a few images of what Agbogbloshie – dimensions of 200 x 450 meters – looks like on a weekday. And like this – note the young man pushing the cart piled with car doors and other parts. And one of the product streams it produces is stuff like this (note the engine block, transmission case, and other auto scrap), that can be sold as metal. Unfortunately, if you don’t have the proper equipment, automobiles are just as difficult, if not polluting, to recycle as old electronics. Ghana doesn’t have the equipment. This creates problems with two waste streams. First, the wires and cables that are part of our ever-increasingly computerized automobiles. And second, the tires. 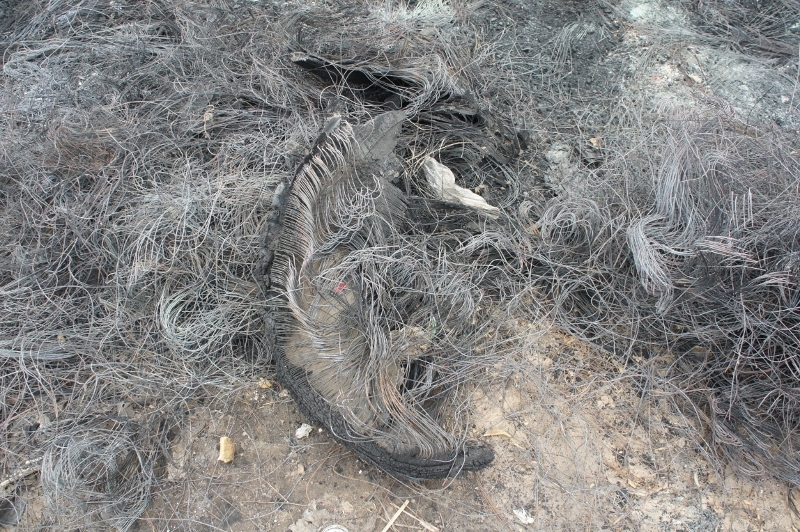 This brings me back to the question of what to make of all those photos of fires and burning scrap at Agbogbloshie. 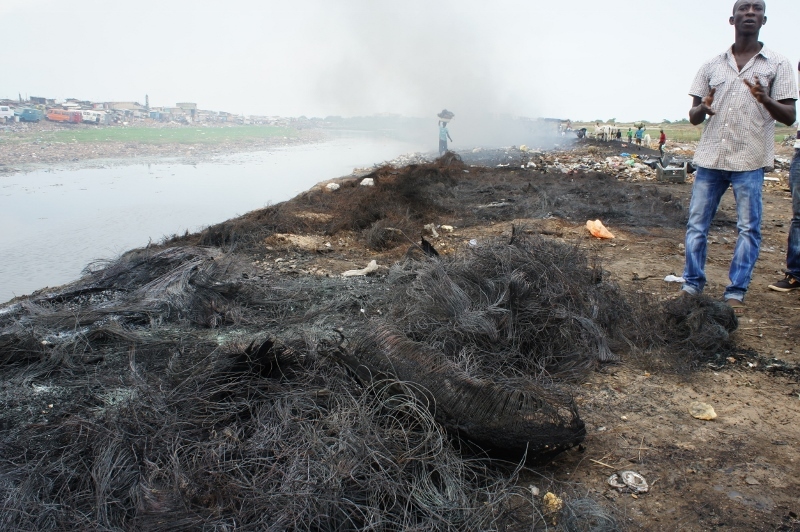 Here’s a photo of a typical, just-completed burn scene at Agbogbloshie. It caused a lot of smoke, a lot of fire, and a lot of coughing (mine included). And here’s a close-up of what was burnt. That’s right, tires. Now, I can’t tell you that I know what percent of what’s burnt at the site is tires, and what’s everything else (getting to that). But I can tell you that the tire burn area takes up 80% of the space devoted to burning. And it’s nasty. 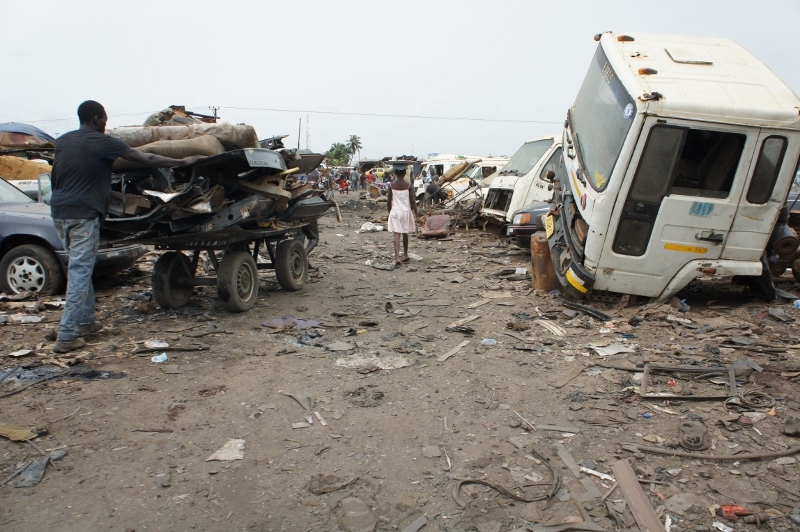 But because Ghana’s automobile recycling sector is very undeveloped, there isn’t much alternative (tires are notorious breeding grounds for mosquitoes, which in Ghana – where malaria and yellow fever are endemic – is unacceptable). 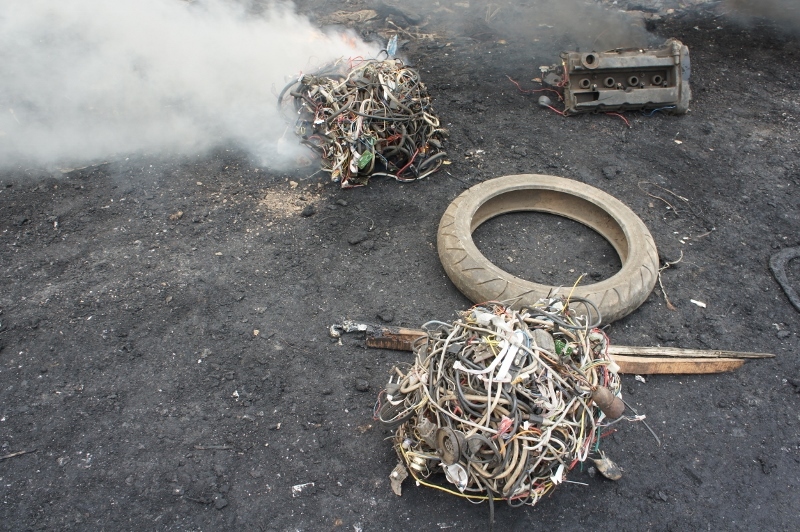 Meanwhile, further down the burn area, workers torch 10 lb bundles of wire and cable that are outsourced for burning (to get rid of the insulation) to them by businesses within Agbogbloshie. 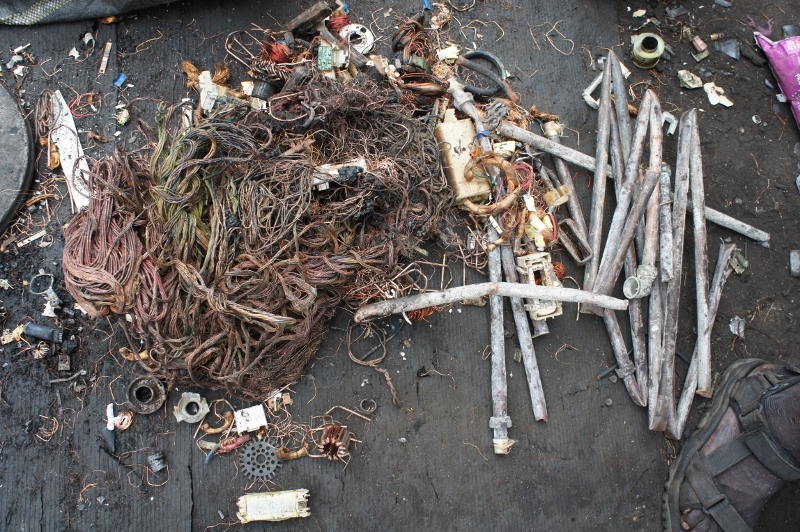 Anyone who knows scrap metal – or the inside of a computer or television – should be able to tell right away that these bundles contain far more than wires from an old ThinkPad or VCR. They contain, rather, wiring from a broad range of electrical goods, including – and primarily – automobile harnesses (the wiring hub within and beneath your car). I want to be clear. Just because it’s automobile cabling – rather than ribbon cables from inside a PC – being burnt, doesn’t mean it’s ok. Pretty much nothing at Agbogbloshie qualifies as a best or even adequate practice when it comes to human health and the environment. They are, instead, the practices available to a small-scale recycling industry that functions on very little capital. 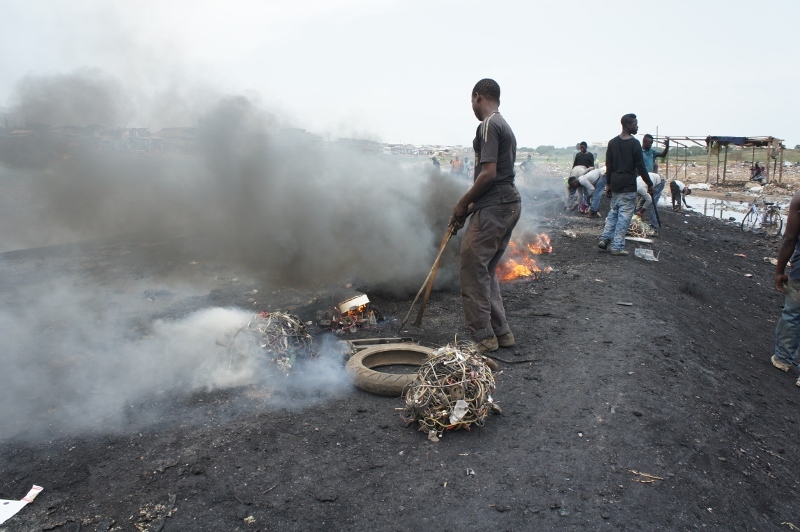 That could and probably will change as some of the scrap dealers start making more money, and the government decides that it wants to improve Accra’s air quality. 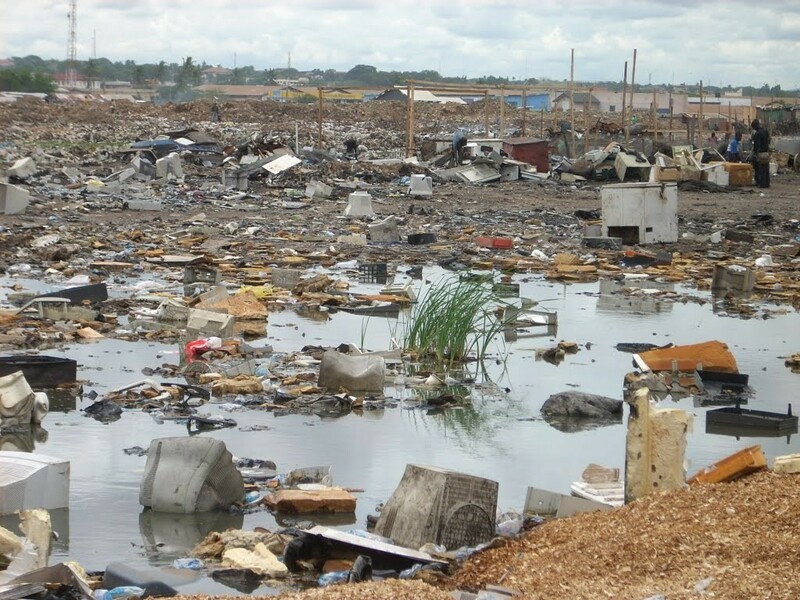 But other groups – NGOs in particular – have other ideas about how to help Agbogbloshie, including bans on the export of repairable electronics from the developed world, and the installation of totally inappropriate equipment at the recycling site. But here’s the thing. If you want to fix Agbogbloshie, you need to understand what’s happening there. 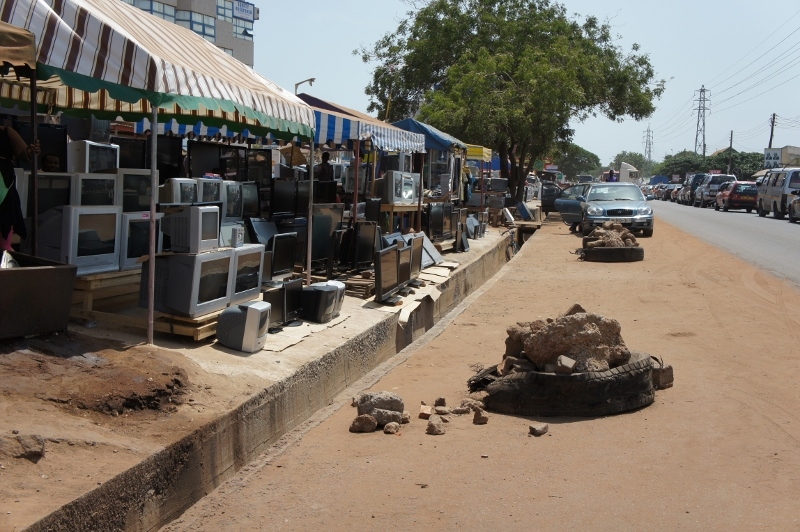 Calling it the world’s biggest digital dump and erecting trade and even criminal barriers to prevent used electronics will only serve to deprive Ghanaians of access to affordable information technology, while doing nothing to prevent them from selling those cheap electronics to Agbogbloshie when they’re done with them. 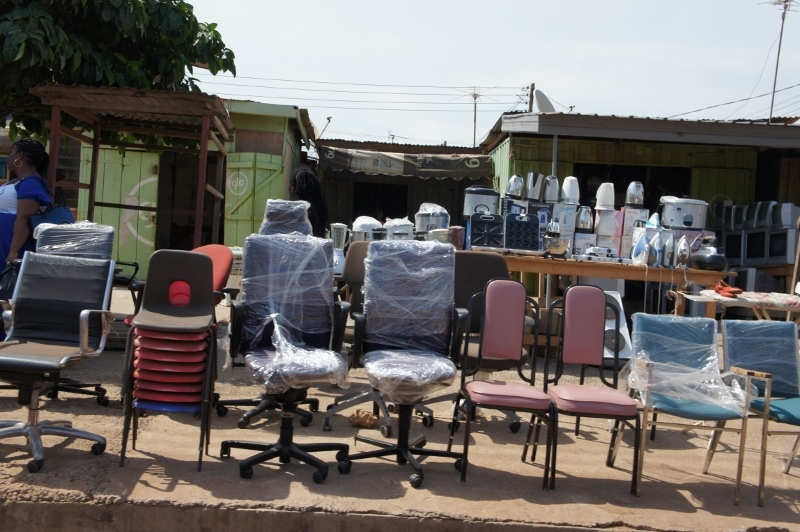 And that won’t be any time soon – Ghana’s culture of use, repair, re-use, and further repair and re-use ensures that Ghanaians will utilize used electronics much longer than their original owners would ever have believed possible (ten-year-old functioning Windows 95 PCs are common throughout Ghana). 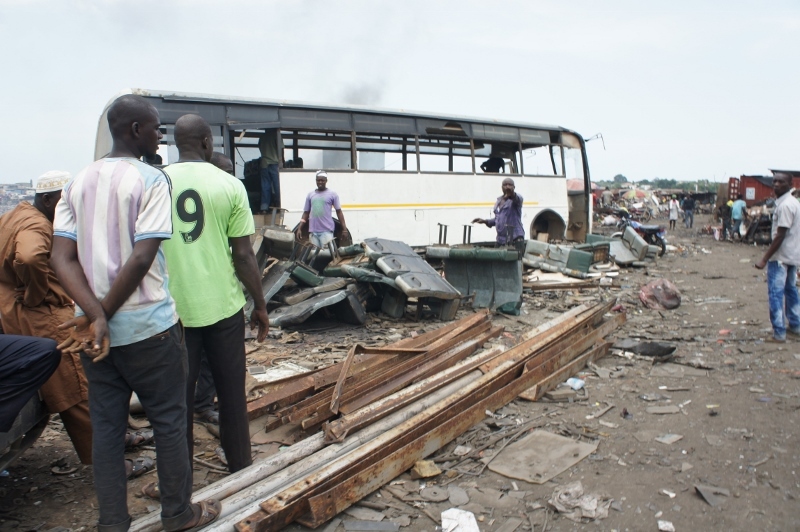 Understanding Agbogbloshie as an electronics dump only serves to ensure that far bigger problems – such as what to do with Ghana’s dead cars – won’t get attention. What I fear is that my friends in the media, always looking for an interesting angle on “the tech story” won’t find Agbogbloshie as worthy of their attention if the problem turns out to be Toyotas and Fords, rather than Apples and Dells. If that’s the case, they’ve not only mis-served themselves, but also the good people of Agbogbloshie who are – ostensibly – the reason their workplace is worth photographing in the first place. 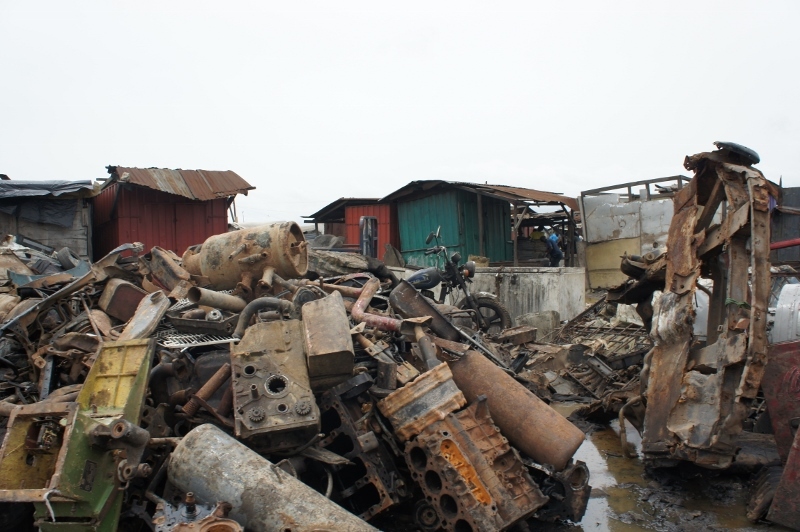 This entry was posted in Computing, Junkyard Planet, Scrap and tagged e-waste, Ghana by Adam. Bookmark the permalink.